Mozoon Towers ... one of Bauer’s key projects currently under way. 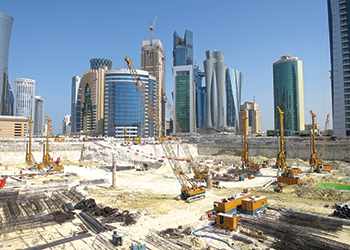 Germany-based Bauer Spezialtiefbau has boosted its portfolio of prestigious projects with the contract for the enabling works package on the Mozoon Towers project in Doha, Qatar. Mozoon Towers will be located in Al Dafna area and will comprise four hotels and apartment towers and quality retail space. Oberoi and Marriott will operate the hotels and serviced apartments in this complex. Bauer was awarded the contract by General Real Estate Company (GREC), which has been given the responsibility of managing the project by Mozoon Real Estate, a subsidiary of Qatar General Insurance and Reinsurance Company. 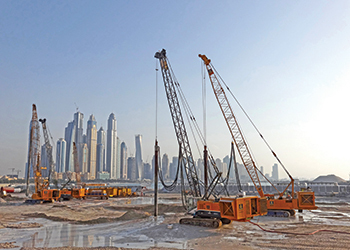 The project is among the latest contracts secured by Bauer, a provider of services, machinery and products for ground and groundwater, which has had a strong presence in the Gulf since 1979. The Mozoon Towers deal is just one of its many projects currently under way, with others being the Lusail Towers in Qatar; Riyadh Metro in Saudi Arabia; and an Emirates Global Aluminium deal and a project at Zakum Island in the UAE. Bauer founded its first subsidiary in the Gulf region in Saudi Arabia in 1979, followed by subsidiaries in the UAE in 1982 and Qatar in 2004. 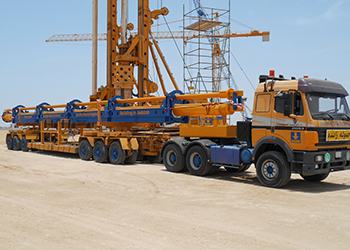 Saudi Bauer started with three to four rigs and with approximately 20 employees. Today, more than 45 rigs and more than 1,000 employees are operating in the Gulf region, highlighting the importance the company gives to the region. 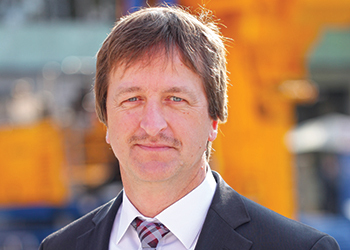 “In the Gulf region, it is our aim to increase our capacity in Saudi Arabia to cover different areas in the country like the Eastern Province,” Harald Heinzelmann, managing director of Bauer Spezialtiefbau, tells Gulf Construction. Some of the most challenging projects the company has undertaken in the Gulf region include the Madinah Car Park and Kingdom Tower in Saudi Arabia; and Emirates Towers, Burj Khalifa and Dubai Metro in Dubai and the Conference Palace in Abu Dhabi, all in the UAE. “These projects have been challenging due to their size and complexity, ground conditions and a very tight schedule as well as the fact that these big projects were required to be handled simultaneously, the technical specifications of the project, ancillary conditions and very stringent tolerances,” says Heinzelmann. Elaborating on the Kingdom Tower project in the Saudi commercial capital of Jeddah, he says it was originally designed to be one mile high. In 2011, the design was scaled down to a height of approximately 1,000 m. In August 2011, Saudi Binladin Group (SBG) was awarded the tower’s construction contract and in October 2012, Saudi Bauer Foundation Contractors was appointed subcontractor by SBG for piling, shoring, and earthmoving and dewatering works. 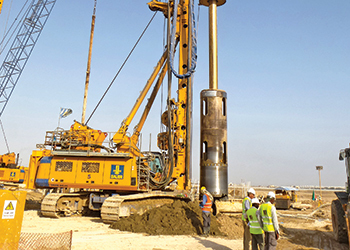 Saudi Bauer’s scope of works on the project included 270 foundation piles with drilling depths of 49 to 109 m (diameters of 1.5 m and 1.8 m), involving some 18,000 drilling metres and installation of 40,000 cu m of concrete and 6,000 tonnes of reinforcement; as well as conducting four static pile tests using Osterberg-cells. In addition, works included 75 linear metres of secant pile walls for the core area; dewatering of the core pit; 19,000 cu m of excavation works; and chipping and trimming of all piles (2,000 cu m concrete, unconfined compressive strength, UCS, greater than 75 N per sq mm). Some of the challenges of the Kingdom Tower project, Heinzelmann says, included very deep, non-replaceable piles in heterogeneous soil conditions (test piles performed by another company failed); use of polymer slurry for all piles longer than 45 m; tight tolerances in terms of location and verticality; and very high requirements for the pile concrete and the execution of reinforcement cages. Bauer at work on the Kingdom Tower. Bauer Spezialtiefbau has been a major driving force in the development of specialist foundation engineering, and carries out projects all over the world. It is organised on a regional basis in Germany, and operates on all continents with approximately 40 subsidiaries and branch offices. The company has built up networks in numerous regions across the world, enabling it to acquire and execute contracts both in the countries in which it is represented and in neighbouring countries, using its own machinery and in-house engineering consultancy. Bauer Spezialtiefbau is part of the German Bauer Group, whose operations are divided into three segments: construction, equipment and resources. The construction segment is involved in special foundation engineering works for complex excavation pits and foundations for large infrastructure projects and buildings, cut-off walls and ground improvements all over the world, as well as engineering construction services and project development. The group markets its products and services all over the world. Despite its growth, the group has remained a family business, whose roots go back 225 years. Bauer was founded in 1790. At the beginning of the 19th century, the company became increasingly involved in well-drilling. With Dr Karlheinz Bauer at the helm, the company took its first steps towards specialist foundation engineering in the 1950s. Notable achievements included the development of an injection anchor on a construction site in Munich, Germany, in 1958. Bauer began manufacturing machinery in the 1970s, spurred by the lack of suitable equipment for foundation engineering in the market. The seventh generation of the family joined the firm in 1982 with Professor Thomas Bauer, who after taking over as managing director in 1986, began launching the company globally. New subsidiaries were added to the group and a new environmental technology business was launched, which today forms part of the Resources segment. Bauer Maschinen Group offers a comprehensive range of construction machinery, equipment and tools for the specialist foundation engineering sector as well as for other underground drilling operations, such as for mines, water wells, geothermal energy sources, and oil and gas extraction. The longest Bauer Kelly – 110 m – was used on the project. The Resources segment covers the activities of the group in the areas of water, environment and natural resources. Bauer profits greatly from the collaboration between its three separate segments, enabling it to position itself as an innovative, highly specialised provider of complete solutions and services for demanding projects in the specialist foundation engineering and related markets. Over the past decades, the Bauer Group has pursued a strategy of increasing internationalisation, thereby creating a significant advantage for itself, by being “at home throughout the world”. “In this way, we can compensate for fluctuations in construction markets, which are frequently volatile, and develop the group in a steady manner,” says Heinzelmann. Bauer has had to put in great efforts into the equipment business over a number of years, in response to the uncertainties in the markets. The company’s strategy is to maintain an increasingly efficient, state-of-the-art product portfolio that meets the highest quality standards. “Quality remains one of the fundamental concerns of the top management in our companies. We do everything in our power to maintain and, where possible, further grow our customers’ trust in our companies and the quality of our products, services and equipment. We work hard to understand the needs and expectations of our customers so we can then meet them quickly, reliably and cost-effectively. In addition, the Bauer Group again invested substantial sums in developing new construction methods and machinery in 2014,” he adds. In terms of business, Heinzelmann says that despite the turbulence in the markets in 2014, Bauer succeeded in achieving its revenue targets. With total group revenues of €1.56 billion ($1.69 billion), it exceeded the previous year’s value by 3.7 per cent. Developments over 2015, he says, have increased the company’s confidence about the future. “Orders in hand have already increased and we are finding additional opportunities. Concerning the Gulf region, overall the business over the past year was good and slightly better than the past three years. However, it is expected to slightly go down in the coming year due to the drastic drop of oil prices,” he continues. He further says that during the past year, Bauer has devoted a great deal of efforts to prepare the company to face the future even more effectively. “All major investments were able to be completed, as a result of which the full attention of our management team is concentrated on markets, products and commercial processes. This will give us stability for the future in a continuing volatile environment. Bauer at the Palm Jumeirah in Dubai. “Achieving success within a major corporation is also heavily linked to its basic organisational structure. We have been working hard on that aspect in recent years, and we are convinced that we are now very well positioned,” Heinzelmann states confidently. He points out that the company has focused closely on international networking, so that today almost all subsidiaries worldwide are interconnected via a centralised IT network and shared software platforms. This provides the company with close control, delivering massive benefits particularly in terms of logistics and parts supply. Bauer has also made great progress with regard to its management systems. Lots of positive changes have also been made in relation to health, safety and environment (HSE). In addition, it also strives to open up new areas of business. In 2011, for example, Bauer Renewables, a subsidiary of Bauer Spezialtiefbau successfully installed a drilled monopile foundation structure for a tidal energy turbine. This took place off-shore at the test site of the European Marine Energy Centre (EMEC) in Orkney, Scotland. An exceptional challenge was posed not only by the drilling works at a water depth of 37 m, but also by the extremely strong currents of up to 4.5 m per second. Bauer Renewables used a newly designed and built seabed drilling rig from Bauer Maschinen. Looking to the future, Heinzelmann acknowledges that conditions are going to remain turbulent. “The global economy will be marked by rapidly alternating positive and negative trends over the coming years. Though conditions are not easy at present, it is certainly a very interesting and challenging time. We will continue to meet those challenges with great enthusiasm and commitment, so as to exploit every opportunity to drive our business forward. We are making great efforts to maintain a competitive edge in all the products and services we offer,” he elaborates. Back home, he says the German construction market will continue to see positive growth over the coming years. In 2014, companies of the Bauer Group employed about 10,400 people in approximately 70 countries. More than 1,000 people are employed in the Gulf region and the turnover of its subsidiaries here is approximately $120 million.